WATCHED the documentary Four Sons Vs Four Daughters after being poked about it by various friends. This followed a weekend where the parents of, er, four sons swapped lives with. . .well, you get the picture. Both families were reasonably well-off, and had lovely kids: very stereotypical sporty boys and ballet-dancing, girly girls. The only really interesting outcome was seeing the ‘background parent’ (the mum of the boys and the dad of the girls) realising how left-out they had become. This was nothing to do with the kids. It was entirely to do with the Dad of the Boys being sporty and the Mum of the Girls being girly. If the genders had been more mixed, I’m not sure the families would have been any different; it was clear the Boy Dad and the Girl Mum were the dominant forces in their homes regardless. People often seem to assume that having gender-biased offspring means you are different compared to those with a mixture of boys and girls. And that if you, like us, end up with a girl after lots of boys, or a son after lots of daughters, you must have felt somehow lacking beforehand. It doesn’t feel that way to me. I had a lump in my throat when the program showed how the parents felt when their children were born. It simply didn’t matter that they had girl after girl or boy after boy. And honestly, it was the same for us. In fact, it was more of a shock when Bonnie wasn’t a boy. Our boys aren’t always wrestling or shooting toy guns, although they do always want to spend any spare moment kicking a ball around. While we do spend a large amount of our time ferrying them to football, rugby or cricket, they do also help out with the cooking – often without being asked or cajoled. Some of them do drama. Some of them sometimes like drawing and dancing. She may only be two, but so far, Bonnie is no different. I If there’s a ball being kicked about, she wants to join in. If there’s tickling, play-fighting or playdough monster-making going on, she’s elbowing her way into the action. But she also likes pushing dolls around in a pram. She’ll run to get the dustpan and brush if anything gets spilled. She has demanded that her tiny toenails get painted with varnish like Mummy’s so she can “have lady toes.” She can make a sulk last hours. Is that because she’ girly or just because she’s joining in with her surroundings? Am I indulging her in a way I wouldn’t have with the boys? It’s inevitable that our children will be influenced by what’s closest to home. I’ve never been very girly, but then I had no sisters, two brothers, and was brought up in a boys boarding school. Might I have been less sporty and more interested in shopping (ugh!) and make-up (boring) if my brothers been sisters and the school had been for girls? I’m not sure. 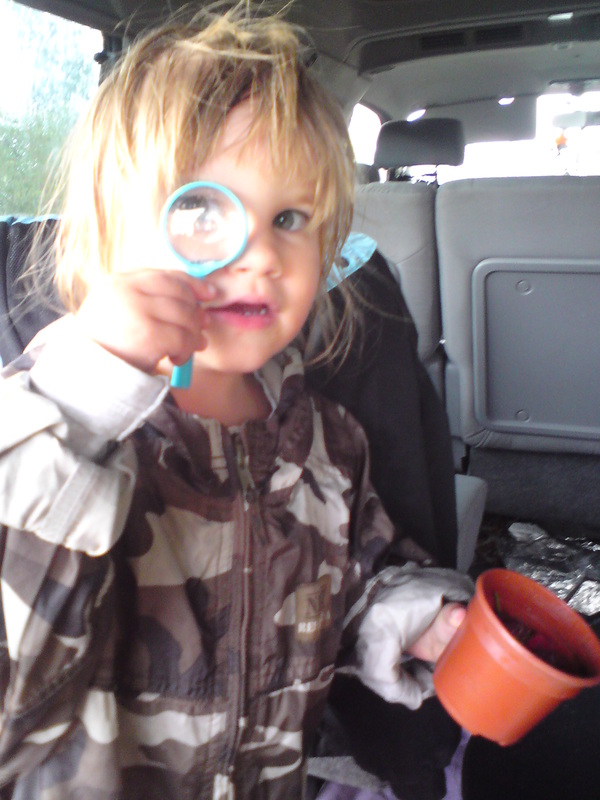 . .
Bonnie is showing tom-boy tendencies – getting filthy at the allotment, insisting on wearing her brother’s ‘soldier’ coat, refusing to have her hair brushed and trying to pick up insects – but I’m sure there are plenty of girls without male siblings who are just the same. She’s also recently become obsessed with those crappy plastic Disney shoes that little girls clip-clop around in. She’s actually tried to steal them from other children. Still, she walks better in heels than I do. Our kids will develop their own likes and dislikes, influenced by their families and their friends. (Hopefully not too much by television and the media, where aspirations seem limited to being either footballers or their wives). It’s up to us as parents to allow them to try as broad a range of experiences as we can, and get away from gender stereotypes altogether. Meanwhile, part of me is quite enjoying having my make-up ‘applied’ by my grinning daughter. I hope her technique improves though, I need all the help I can get. your weblog posts. After all I’ll be subscribing in your rss feed and I hope you write again very soon!